We’ve reached another marker in the countdown to polling day, so it’s time for another prediction of the election result. I’m now suggesting Labour will win 308 seats, up 50 on the 2010 result (this total includes Corby, which Labour won from the Tories in the 2012 by-election). The Tories will win 275, down 31 (this total doesn’t include the Speaker, nor Corby). The Liberal Democrats will win 37, down 20. Others, including the Speaker and George Galloway, who I’ve assumed will hold his 2012 by-election gain in Bradford West, will total 30. Others does not include any gains for Ukip. I will wait until they actually win the Clacton by-election before deciding whether they stand a chance of a) holding it at the general election and b) adding to it with gains elsewhere. For now, their total remains zero. With each month that passes without the Tories narrowing the gap in the polls behind Labour, let alone overtaking them, so the chances of Labour winning most seats in the election grows. As such I’ve upped Labour’s total since last month, but only by three. My gut feeling remains that a Labour majority (326 seats or above) is too big a task. As for the Lib Dems, with each month that passes without them managing to get back above 10% in the polls, so the number of seats they stand to lose increases. This month I’ve revised their losses up from 19 to 20, handing the Tories the seat of Berwick-upon-Tweed. Mind you, 20 is still far below the number mooted by the likes of electionforecast.co.uk. Based on my prediction, a Labour-Lib Dem coalition would total 335, nine above the number needed for an absolute majority in parliament. 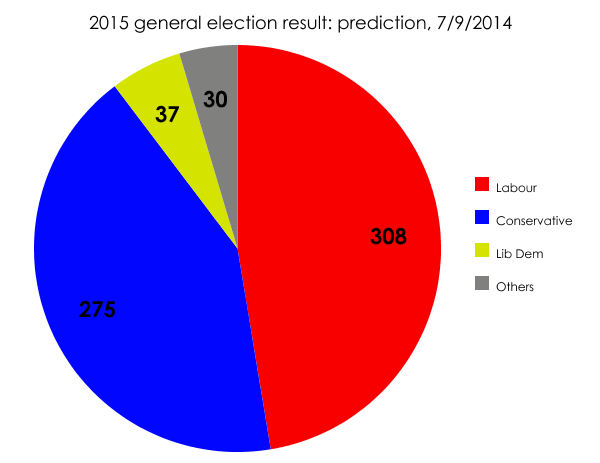 A Tory-Lib Dem coalition would total 312: 14 below the magic figure of 326. From the Lib Dems: Norwich South, Bradford East, Brent Central, Burnley, Manchester Withington, Dunbartonshire East, Birmingham Yardley, Edinburgh West, Hornsey & Wood Green, Cardiff Central and Redcar (total = 11). From the Tories: Warwickshire North, Hendon, Cardiff North, Sherwood, Stockton South, Lancaster & Fleetwood, Broxtowe, Amber Valley, Wolverhampton South West, Waveney, Carlisle, Morecambe & Lunesdale, Weaver Vale, Lincoln, Plymouth Sutton & Devonport, Stroud, Brighton Kemptown, Bedford, Dewsbury, Warrington South, Pudsey, Enfield North, Hove, Northampton North, Brentford & Isleworth, Hastings & Rye, Halesowen & Rowley Regis, Nuneaton, Ipswich, Blackpool North & Cleveleys, Bury North, Gloucester, Wirral West, Croydon Central, Harrow East, Ealing Central & Acton, Norwich North, Ilford North and Finchley & Golders Green (total = 39). From the Lib Dems: Solihull, Dorset Mid & Poole North, Wells, St Austell & Newquay, St Ives, Somerton & Frome, Chippenham, Berwick-upon-Tweed and Cornwall North. The six species of Lib Dem MP: how many are about to become extinct?